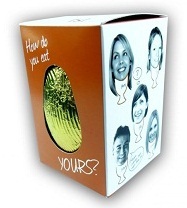 Weighing at 55g and small in size, these personalised Small Company Easter Egg Gifts are an advertising delight - 6 sides of custom branding area for your brand-name logo and artwork to be printed over in full colour. Easter presents an enormous opportunity to hand out a business gift that customers will remember you by and most likely come back for more business in the near future. Why not hand out some Small Company Easter Egg Gifts with your Company brand name and logo and get your name about? For a FREE QUOTE, please fill in the form regarding our Small Company Easter Egg Gifts and we'll be able to help you. Why not have a look a our Promotional Easter Products department for more easter business gifts? Why not have a look at our other promotional Easter items?